The new Mk7 and Mk7.5 Fiesta EcoBoost can benefit from upgrading the brakes. 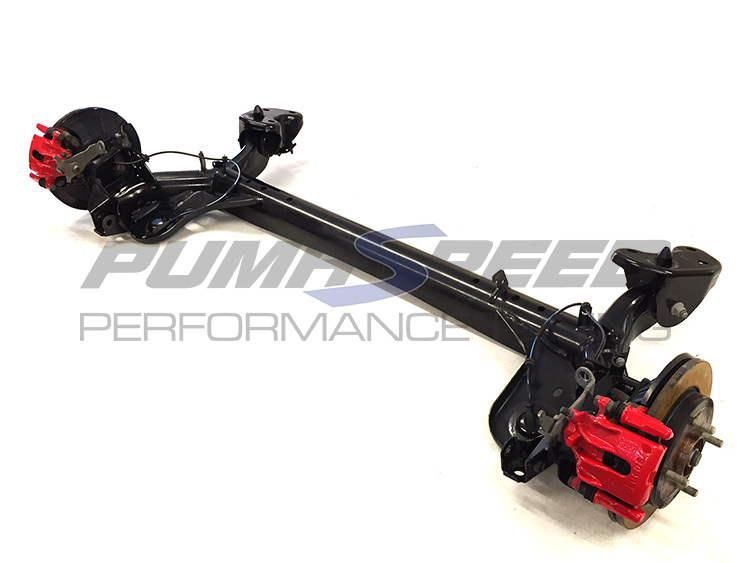 Pumaspeed have in stock a Full Rear Axle direct from the new ST180 Fiesta ready to bolt on top the rear of any Mk7 or Mk7.5 Ford Fiesta. The whole Rear Beam must be swapped on the Mk7 and Mk7.5 models unlike the older Mk6 where you could simply bolt on the Two Stub Axle assemblies. The Axle comes complete with new Rear Discs, new Rear Pads and a new Handbrake Cable. It was removed for a car we broke for spares for racing and it has covered 8700 miles. There is a choice of using a Full Set of Braided Lines to suit also at extra cost, as the stock flexis are not included. Please Note: Due to the size and weight of this unit, we may have to split the Hubs from the Central Beam and ship in two parcels, but please us call on 01924360260 if you require more information. WORKSHOP FITTING IS AVAILABLE BY PUMASPEED WITH A COST OF APPROXIMATELY £150. The Pumaspeed Workshop team are ready to fit the Rear Axle with Disc Brakes in our Head Office located here. Therefore making parts and labour a total cost £725.48 (inc. VAT). Pumaspeed have a specialist distribution team that can dispatch the Rear Axle with Disc Brakes to any destination worldwide.